– Contest Closed – Congrats to Laurie! Frito Lay contacted me with not only the tasty recipe you just read, but also a few other healthy tips for summer BBQ season so we don’t pack on the pounds. You can check out their site to find out more about their brands, healthy snacking, and even where the potatoes were grown for your chips. Be sure to check out their recipe page to where you can find even more great dip recipes. Vegetable and bean dips are a great way to integrate veggies into your diet. With just 3 ingredients, Frito Lay corn chips are a perfect accompaniment to those dips. Sabra Hummus and Tostitios Salsa are also great with Frito corn chips and Tostitos tortilla chips. At cookouts, use whole grain breads for hamburger and hot dog rolls. You can also use SunChips multi-grain snacks that have 18 grams of grains in every once serving. The most important tip to summer BBQ season – downsize your dish. Swap that 12 inch dish for a 10 inch dish, and you’ll have less space to pile up the calories. Aim to fill your plate half with veggies, a quarter with grains, and a quarter with lean proteins. Mix all ingredients in a large bowl and refrigerate until ready to serve. Frito Lay is also offering a patriotic prize pack to one lucky reader who comments below. It includes this cute platter and some Frito Lay snacks. Just tell me what your favorite dip is to enter the giveaway. The winner will be chosen by Random.org. Giveaway ends July 23rd at midnight. Winner announced July 24th. Winner must respond back to me with contact info within 72 hours, or I’ll go to the next winner. Void where prohibited. Must be over 18 years. For extra entries, share on Facebook, stumble, retweet, blog it, subscribe to my new newsletter, like Eclectic Recipes on Facebook, suggest Eclectic Recipes to some friends on facebook, or link to me somehow. I’m not picky. Just leave an additional comment for each extra entry you do so I can count them easily. Thanks for participating! Disclaimer: I received a few bags of chips as part of this review. My favorite dip is definitely ‘cranberry chutney’. Love to have it with crackers and chips.Thanks for this giveaway!!! Chips and dips are wonderful during these summer months. My favorite will always be roasted red pepper hummus! I love FRUIT dips. Yummy! I like good ol’ french onion dip but recently have been enjoying homemade roasted red pepper hummus! Like French Onion dip, but my favorite is salsa and chips. My favorite dip, before I tried the Greek yogurt cucumber dip, is the sour cream & onion soup original party dip. I love a good old-fashioned onion dip! I just stumbled it! 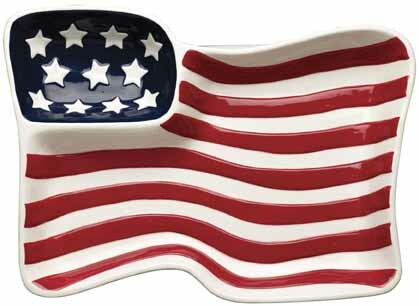 I would love to give the cute flag platter to our good friends who immigrated to the U.S.
Buffalo chicken dip that is spiced up with Texas Pete! writing, in my view its actually remarkable designed for me.